Green peas is in season now. I have given this kurma recipe for Aval vikatan supplement, which i did a year back. 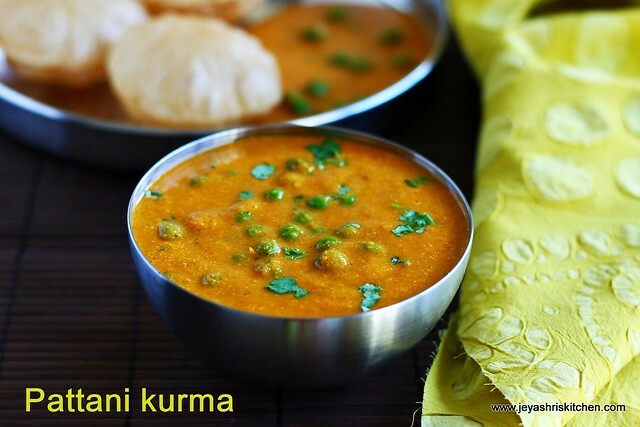 This peas kurma| peas korma| pattani kurma, goes well with poori, chapathi and even for biryani too. 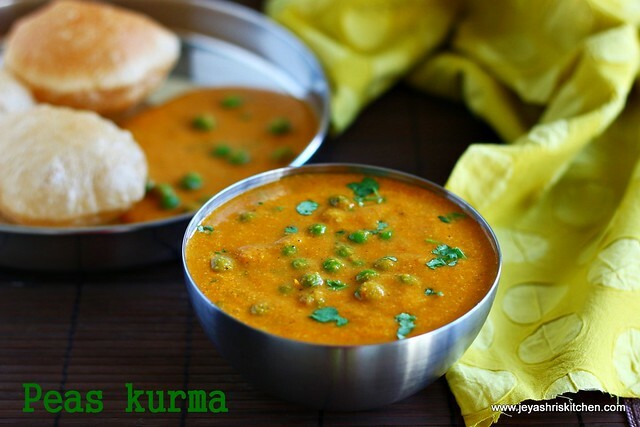 I have given this for the book as Mushroom peas kurma. But now i didn't add mushroom in this recipe. 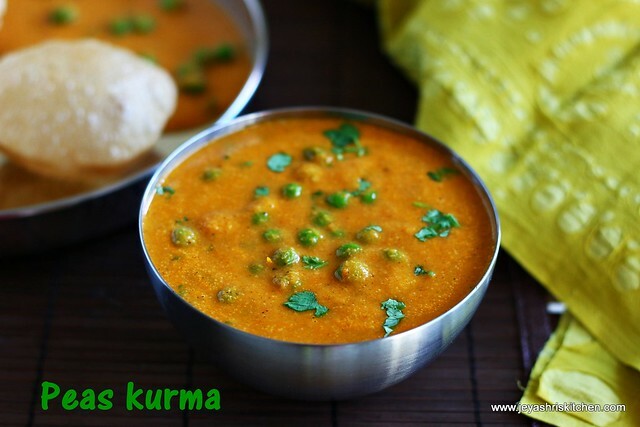 This peas kurma is a super hit at home. Right now i am in chennai on vacation . So please bear with delay in replying your mails. Check out my peas masala recipe and peas curry too. Chop the onions and tomatoes finely. Peel the skin of garlic. In a pan add oil and add the finely chopped onions and garlic pods. When the onions become translucent add the tomatoes. Cook till the tomatoes turn mushy. Add the red chili powder, cumin powder, coriander powder and turmeric powder. Since i don't have fennel seeds i added the fennel powder too. If adding seeds you can add now. Allow this to cool completely. Grind this into a fine paste by adding coconut, kalpaasi and cashew nuts. In a pan add oil and throw in the bay leaf, if adding and add the ground masala. Cook for 3 minutes in a low flame and add the green peas. I used the frozen one and so i didn't cook separately. If using fresh peas pressure cook this for 1-2 whistles. Add 1/2 cup of water or little more to reach the right consistency. Add salt, Let this boil for 5-7 minutes in a medium flame. Switch off the flame till it reaches the right consistency. Peas kurma | pattani kurma is ready to serve. We enjoyed this with hot pooris. Perfect for rotis and pooris. After grinding everything you can , you can put in a cooker and add peas and pressure cook for 1-2 whistles. Adding kalpaasi is optional. But for kurma it is highly recommended. We call it stone flower in english. What to say?tried this recipe yesterday and it turned out so yummy.Hubby likes this kurma so much..thanks for the awesome recipe. I made this today...It's wonderful, thank you for the recipe.